(By Austin Thomson • Staff Writer. Williamson Herald. Click HERE for full article) Students at Poplar Grove Middle School gathered in the gym for the school’s PRIDE Time celebration, which is a time for the school to honor students’ accomplishments. 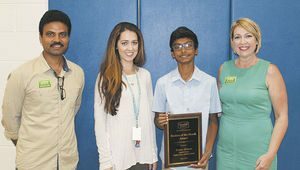 For Rohan Alokam, an 8th grader, he was surprised to receive the Goodall Homes Student of the Month award. His parents, Venu and Sree Alokam, were proudly in attendance to congratulate their son. Rohan participates in the school’s Beta Club, which holds an annual food drive. He is also a member of the cross country and tennis teams. In band, his musical talent shines when he plays the saxophone. Rohan’s teacher Laura Lavery nominated him for his improved academic success. “Rohan has turned in every assignment ahead of time and consistently gone out of his way to improve as an 8th grader,” Lavery said. To nominate a student for the Goodall Homes Student of the Month, visit www.williamsonheald.com and submit a nomination form.